I’ve always been attracted to asymmetrical pieces so it was only natural that I fell in love with this skirt when I set eyes on it. 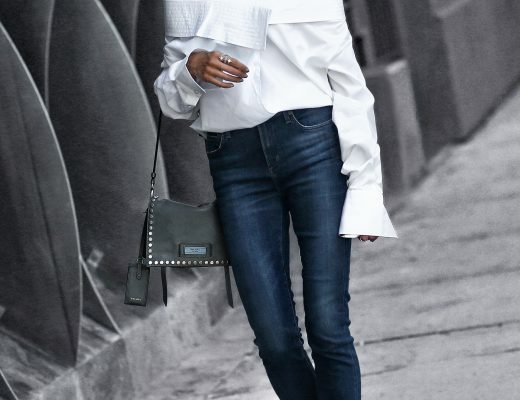 Being a jeans girl at heart, but loving dressier pieces, I am often challenged in styling these fancier/statement pieces for more of an everyday/night out look. After all, it is a waste if the piece just lives in the closet! My solution to making dressier pieces more wearable for everyday is always to dress them down by bringing in everyday items – chunky sweaters, tee shirts, and flats always make great options. For today’s look I chose to pair my eye-catching skirt with a tobacco colored leather jacket (feels more casual than black) and a cozy chunky scarf. The chunky scarf particularly brings the look down because of its cozy feel – kind of like a chunky sweater would. I’ve even seen trendsetters flawlessly pair a dressy skirt with a great sweatshirt or even sneakers for mega contrast (but that type of dressing is best left for the style experts because getting it right is really tricky). When bringing in these more casual pieces the key is to have the outfit flow so that the casual piece melds with the rest of the look instead of being the focus. One tip is to have the casual and dressier piece in the same color to ensure such a blending of the two. That symmetrical skirt is killer! I love how you styled the skirt is such an unexpected way! The rings you’re wearing are fabulous, and add just the right touch. This extreme asymmetry is perfection! You look gorgeous! I have a great giveaway up on my blog, I hope you will check it out! This look is gorgeous! I just started a fashion blog and would love it if you swung by when you have time.